Bariatric Lifts are used to transfer bariatric patients from one location to the next. Constructed with heavy duty materials, bariatric patient lifts lift the patient with a sling to transport them to another resting device. 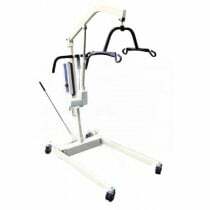 Heavy Duty Patient Lifts offer safe transfers for mobility patients as well as caregivers. Most bariatric lifts have a capacity of 500 to 1000 pounds. 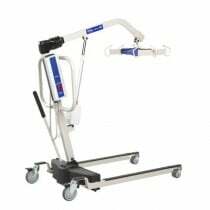 Hoyer lifts are the most popular heavy duty lift, but Invacare, Drive Medical and Graham-Field also manufacture bariatric lifts for hospital and homecare use. 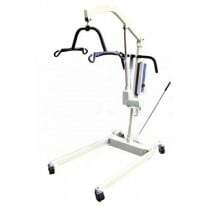 Heavy Duty Bariatric Patient Lifts offer a design that often incorporates two base legs that are adjustable in width and length to ensure a sturdy foundation throughout the transfer process. The legs are close for transporting through narrow doorways and hallways. These heavy duty lifts are available with manual hydraulic, electric or battery powered lifting mechanisms. Battery powered bariatric lifts allow continued lifting and lowering service during power outages and when electrical outlets are not available. Battery power heavy duty lifts usually use a heavy duty 24 volt systems. Vitality Medical provides other patient lift choices, including power lifts, bath lifts, pool lifts, hydraulic lifts and lift slings. Muir, Marylou, and Gail Archer-Heese. "Essentials of a bariatric patient handling program." OJIN: The Online Journal of Issues in Nursing 14.1 (2009): 5.